Each #10 can makes 133 8 ounce servings of Old Fashioned Lemonade. Honeyville's Old Fashioned Lemonade is the perfect, sweet-tart, thirst quencher on a hot summer day, but don't let that limit you. Our delicious, Old Fashioned Lemonade is a treat year round, with All Natural lemon flavor. Each can makes 133 servings, so mix up a pitcher, sit back, relax, and enjoy! 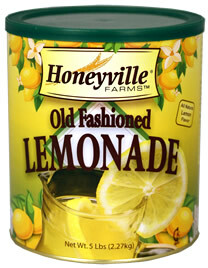 Directions: Using chart on can, measure Honeyville Mix into large plastic or glass pitcher. Add cold water and ice. Stir. Do not store in metal container.